- Also adds 2" to the stock length of the bike! 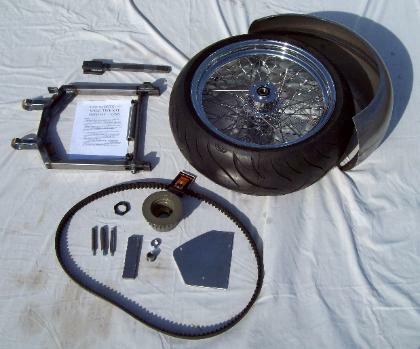 - 240/250 wide tire swingarm kit. - DIY axle spacer tube. - 18" x 8.5" 60 spoke rim with 240/250 tire mounted and balanced. - 1" to 3/4" axle reducer bushings. NOTE: ONLY the 2004-up kit is available in standard length and a 2"
time of the order, or you will be sent the standard length kit. - Longer belt for swingarm conversion ($160). 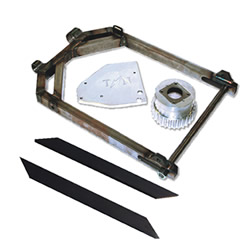 - Outboard bearing support plate ($390). - Solo seat, springs and mounting hardware ($250).